Artful Affirmations: Tea Cup Tuesday-Exquisite Cups to Dream About! Welcome to Tea Cup Tuesday! It has been dark and rainy here, too dim to photograph my own cups. So I went online to look for cups I wish I could own. Most of the cups I am sharing are over $300! Some almost $500! It is fun to dream though! I am going to start with this absolutely gorgeous cup! This is the first cup I found. It is by Aynsley and called Athens Butterfly. My sister Kathleen would love this cup too! This golden beauty is attributed to George Jones, an English Potter during the 19th and early 20th century. I had not heard of this potter before. This beautiful cup is an Aynsley. It was called Surreal Roses on the site I found it on. This incredible cup was made by Shafford in Japan. This company created china ware from 1940-1970. The roses are the most gorgeous colors! The design so unique! This dramatically stunning cup is also an Aynsley. It was called Emperor Rich Gold on the site. I would love a closer look at the bottom inside of the cup, what I can see of the flowers looks so beautiful! The gold trims are so lush! This is certainly a cup for a princess! This beauty is also an Aynsley! If you want to see where I found these cups I have "pinned" these images on my board at Pinterest. Have you heard of "Pinning"? It is so fun! You find something interesting and you pin it to one of your boards. The link to where I found the image is just below the pic. If you would like to join in Tea Cup Tuesday, just create a post with your tea cup in it and then come back here and hook up with Linky Tools below. Martha and I love to come an see your beautiful blogs and tea cups! Terri, These are absolutely stunning. Love your choice of teacups! Gorgeous! Really jeweled beauties! They are all beautiful! Thank you for hosting and have a wonderful week! that is truly a dreamably collection of nice tea cups. Especially the ones with roses are so nice. And also the first one with the butterfly. I have seen pinterest but I didn't understand how it works. Thank you for sharing. Wow... those are definitely tea cups to dream about. They're so lovely, I wish I had them all. This is my first tea cup Tuesday. I'm so excited to be able to participate. Thanks for hosting! I have browsed teacups for sale on-line and found beauties that were far beyond my budget, yet you're right, we can dream! Beautiful teacups. Terri, good morning! My prize of the CD arrived yesterday! Today's the day I put it in my PC and begin to look at all of the illustrations and start to conjure up some new projects from them! Hope you have a wonderful Teacup Tuesday. I'm all out of new ones to post about. Don't you think I need another antiquing trip? ;-) It's been awhile. Well, Terri, it looks like you have found the mother load! Such beautiful selections. I think Aynsley is going to be my favorite because there is such a variety. Good choices, everyone!! Oh, Terri, these are all so gorgeous!! The Athens Butterfly one is my fav. Yes, it's nice to dream! Thanks for hosting! The turquoise cup with the butterfly..WOW! It's gorgeous. It's very dark and drizzly here, too..we had a big storm blow in yesterday, and today it finally cooled off. Have a wonderful day, Terri.. I have found these "over-the-top"
cups and saucers on ebay, too!! The "ATHENS" butterfly really caught my eye...and your photo of "SURREAL ROSES" is gorgeous!! Yes, they are for dreaming only, but......they are wonderful, aren't they?? Stunning teacups - just gorgeous! And you take absolutely beautiful photographs. WOW. I am so glad that you posted a way to get to the original location of the photos. You had me worried there for a moment. These cups are all so beautiful. I can see why they would be on your wish list! The teal cup with the butterfly at the top is amazing! How beautiful! It is fun to dream isn't it? The first cup with the butterfly...amazing! I could stop right there, but no...the beauty went on:) They are all gorgeous! A bit pricy for my collection...but that's what dreaming is all about. I'm sure your dark stormy day was brightened while making this post. Thank you for sharing it. Terri - You found some real beauties here, costing a pretty penny, too, it looks like! But, the big prize with your post today was being able to follow you on Pinterest!!! I've enjoyed escaping there and "collecting" lots of lovelies and ideas - even if it is just in a virtual world. Useful tool. I dream with those cups too! dificil classificar qual é a mais bela! Aqui no Brazil cidade de São Paulo também um dia cinzento de chuva! Amei encontrar voce no Pinterest! wooowww these are gorgeous!! When I talk to my daughter on skipe,I see her drinking her coffee in those huge american mugs, almost bigger than she is... I understand your teacuppassion! Ooh! All are so beautiful, Terri, especially the one in the first photo! Thank you for sharing! They are special, yes- so beautifully painted all, and in the most breathe taking colour tones, making them little jewels. Happy rest of the week-dear Terri. Oh my, what stunning cups, Terri! Each one is superb. It's fun to dream, isn't it? Thanks for hosting and for your visit. Stunning cups. They are so special. I didn't know you were on Pinterest! ALWAYS a treat to visit...love the gorgeous cups, Terri~ Have a wonderful week! 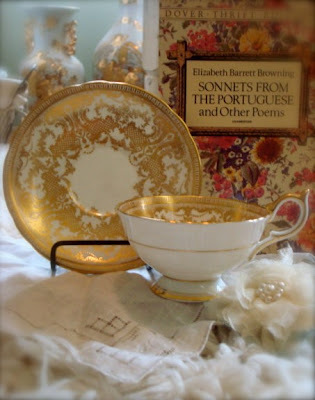 Spectacular enchanting post..i love them and have always been drawn to aynsley in general..spellbinding cups and patterns!! thanks for this super exquisite post..BEAUTIFUL!! Oh!!! Dream is right! Exquisite, Terri! completely stunning! EYE CANDY really..the cup that was second to last, the Anysley I think it was called...so regal with its gold and dark blue and flowers inside, took my breath away! Oooooh I love the first one with the butterfly.